Now’s the time to think about your business goals for 2018, and how you should market your products or services in order to achieve them. If outsourcing your marketing efforts to an agency isn’t a viable option for you at the moment then there are lots of online resources, but it can all be a little overwhelming! Our 7-step plan will help make it a little easier. Don’t forget, Hour Hands can help with all aspects of your marketing – with packages especially designed to work for small businesses. Contact us to find out more. It all starts with your marketing plan. This needn’t be a lengthy document; ask yourself the following questions and note down bullet point answers to help you understand your current situation and the appropriate actions. How is what you’re offering different to this? What are your strengths – what’s gone well, and why? What was less successful for you, and why? Who do you want to reach? Your clients, industry partners, press, etc? Are there any geographical areas you wish to focus on? What do you want to achieve with your marketing? Set short, medium and long-term goals. These should be clear and measurable, such as increase social media reach, receive more website enquiries, or gain more press coverage. How are you going to reach your target audiences? What can you realistically afford? Gather costs to inform your plan. Make sure you don’t just account for payable services such as advertising and print, but also consider the cost of your time, or that of your colleagues. Once you’re clear on your target markets and your goals, and you’ve assessed your competitors, this checklist will help you select your marketing activities. Simply work through the options for each of your service areas or product lines, taking into account who you want to target. The checklist should act as a prompt to select from a broad mix of marketing channels, not just the first approaches that come to mind. What do you want to achieve from social media? Which channels are most appropriate for each of your target audiences? How often do you want to post? What content do you need to support your goals? The following tools will help you to produce and organise regular posts, blogs and newsletters effectively. 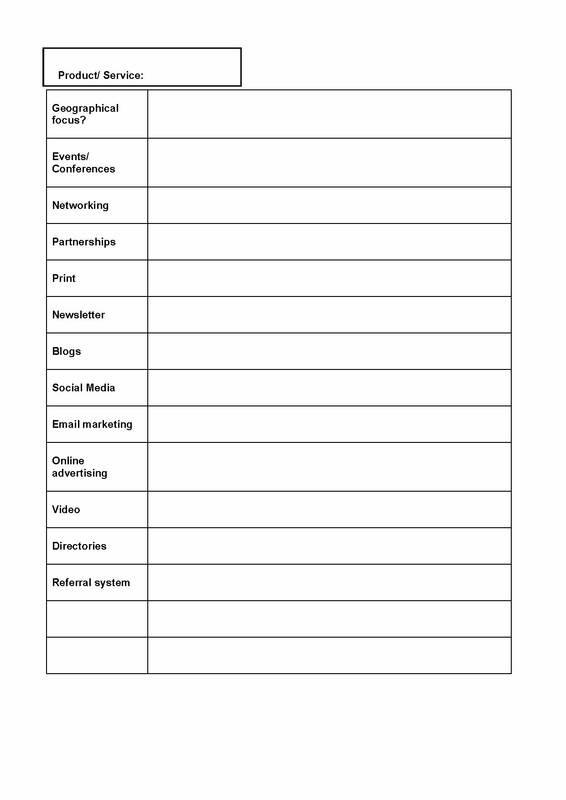 This will help you plan your content on a weekly or daily basis, including the type of content you require and the social media platform you plan to use. The editorial calendar is a great way of pulling together your content ideas and starting to funnel them into a posting schedule. Also, you can add important dates so they don’t get forgotten. There are many available tools to measure the success of your different marketing elements, such as social media analytics. Take advantage of all that you can to discover the true value of your activities. Always take time to check what’s working, what’s not, and where your new leads/clients have come from. Give each activity a chance to work, but don’t be afraid to change things if necessary – flexibility is the key to success.